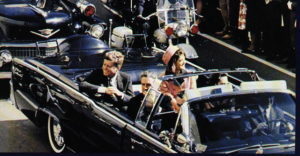 While watching the footage, along with all the parades that were being held over Thanksgiving weekend I had a strange and unusual thought – did the city of Dallas ever have a parade again that took the same exact route as Kennedy had done that day? Ok, maybe it’s a stupid question, but it still makes me curious. I’m sure Dallas must have had parades again. They’re such a common annual events to celebrate holidays. 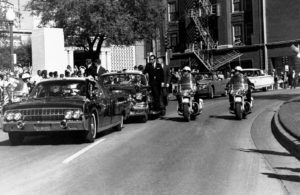 But unlike the jubilant yearly Thanksgiving Day parade in New York, there must of been a very ominous, depressing feeling about parades in Dallas the years following the assassination. From what I have read there were some real anger towards Dallas by the rest of the country for what had happened. People actually blamed the city and state of Texas for Kennedy’s death. The people of Dallas must of felt awful. But I wonder how long it took the city to hold a parade again after that day. I imagine most likely JFK’s parade route was unique – he was the President after all. He arrived at Love Field and traveled into the downtown area, they probably don’t have many instances where those circumstances would take place. But would Dallas ever have a parade route go past the Texas School Depository again? Making that right onto Elm Street and going through Dealey Plaza? I would think it would just be too grim and morbid a reminder of the assassination. It might almost seem a sacrilegious thing to do. Main Street is probably still used for parades, but having a parade route through Dealey Plaza has probably never happened since that day. I would think that area is completely off limits for anything like that. It’s a strange place, Dealey Plaza. On the one hand it’s almost unchanged from 1963, except for a couple of road signs and the redevelopment of the parking area behind the grassy knoll and to get rid of it would be to do away with one of the most famous locations in American history. So it remains unchanged but it can never be the place it was intended to be. You can never quite relax there without the knowledge of what happened in November 1963 gnawing away at you. Which leads, inevitably really, to standing in the various places; the retaining wall, the knoll, where Zapruter stood, where the Babooshka Lady stood and looking up to the Depository window. As it’s so unchanged you can stand on the spot and picture what happened but it will never be a parade route, a street party venue or even a quite place of calm.